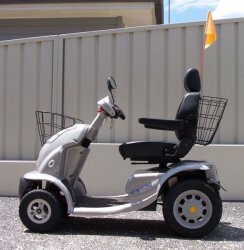 This Afikim Breeze 4 mobility scooter is in really good condition and drives as if new. It holds its charge and has a road speed of approximately 15 km/h. It has a two-speed range switch with lever control for accelerator (RHS) as well as a lever handbrake (LHS).